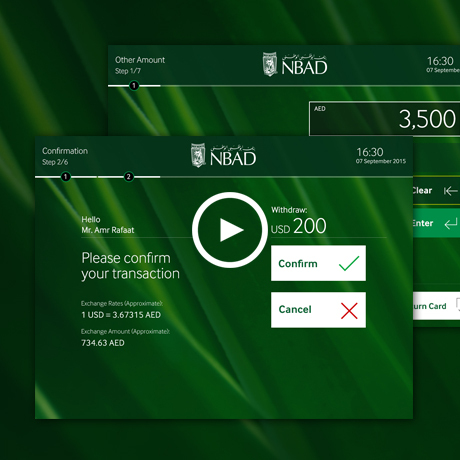 With a new technology adapt for NBAD’s ATM backend, was an opportunity to relook at the UX and offer more user-friendly approach to a rather rigid ATM industry. Keeping in mind the trends of today, a fresh and more intuitive interface was at the horizon. 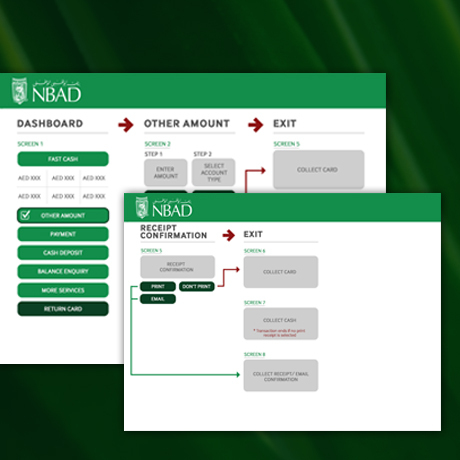 NBAD ATM had adopted a new backend technology called “Aptra” from NCR. The software entitled end else possibilities on both technology and experience front. The brief was to create and experience similar to which the users are now used to while interacting on web & mobile apps of banks and other services. The ease of navigation, forgiving interface, faster transaction and should reflect the brands new vision. All in all an UI which enhances the UX that takes in account the ever evolving user habits, same time taking full advantage of the technology platform. We started with the study of current ATM systems, user habits and time spent. With the help of analytics of the current system, it was easy to understand the most popular transactions, other services that were used periodically but were equally important. Also taking into consideration the transaction NBAD wanted to promote. The first thing was to get the categories right, hierarchy was defined and aligned with the web & mobile apps. Decoding the existing the user flows for each transaction and refining it further to reduce the number of steps. UI was defined based on the user’s interaction habits like right hand first approach. Actionable elements were assigned to the right side of the screen. Steps for each transaction were defined to keep the user informed. Prototypes were created for each approach and tested with different sets of users. These tests resulted in better UI and helped in streamline the user flows. Design approach was to create better affordance for interactive elements and integration of brand elements. Animation were introduced to make the interface intuitive and to signify interactions made by users. We are currently implementing these screens on test ATMs and will be launched soon. Look forward for interesting results.